Corinne Beardsley was born on the Eastern Shore of Maryland. Her love of the physical relationship with the material and the drama of something emerging in space is why she sculpts. She pursued her studies at Hartford Art School in Hartford, CT and University of Massachusetts, Dartmouth; building large scale installations of ceramic figures. After receiving her MFA in sculpture from the New York Academy of Art in 2011, she went to China on an Artist Residency with the Central Academy of Fine Art in Bejing and Shanghai University. Corinne’s current work involves building sculptures, masks, costumes, and collaborative cardboard caves. 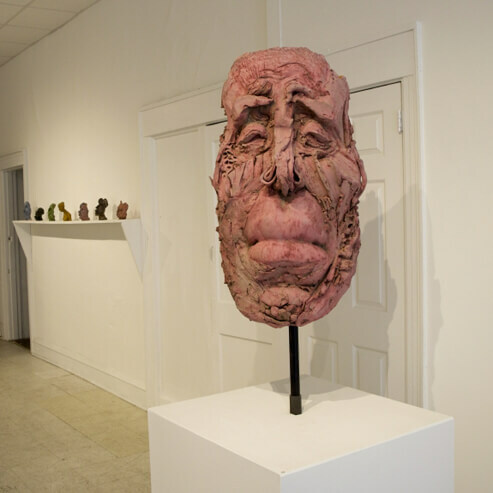 She currently is an Adjunct Professor at the University of Maryland, Eastern Shore and Salisbury University in Ceramics, Drawing and Sculpture.